We have a wide selection of door, window, and exit alarms for your home, office, or workplace. Keep back doors secure, and front doors monitored for safety and security. Great for home security or customer service. Choose the one that best meets your individual needs. Exit alarms are typically used to notify users of unauthorized exits. They are just as useful as products that alert users when doors are opened, and for entrance into monitored areas. If you cannot find what you are looking for in this category, we recommend you visit our Entrance Alert category for additional products that serve a similar purpose. Technically speaking, they are used to monitor egress (exits) through monitored areas. Through the use of sensors, typically contact or movement based, chimes or alarms notify the user that an exit was used. When you need an alert or alarm sound when someone exists through a monitored zone, the exit alarms category is the right place to find the product you need. Whether it's the robust features of a panic bar used to cover an emergency exit, or a simple door/window contact to monitor an exit door, we offer a wide range of products that are cost-effective and reliable. 1800doorbell carries a large assortment of these products that are flexible and may be used in a variety of ways. To make things better organized, products are grouped into specific categories, but as we explain below, there are many uses for these products. Models ALARM-250 and ALARM-700 are products you've seen in commercial environments, like movie theaters, for example. These are commonly known as "panic bars" and are installed by a locksmith on an exit door the user wants to remain shut and wants to be notified when the door is opened. Panic bars allow a door to stay locked from the outside, but in emergency situations, the door may be opened from the inside by pushing the paddle (ALARM-250), or the panic bar (ALARM-700). When these are used to open the door, an alarm sounds. An alternative to these products is a model we call the EX-1, or the STI-6400 Exit Stopper. Using the supplied door/window contacts, this simple to install, DIY product will emit a gentle chime sound, or an extremely loud alarm sound when an unauthorized door is opened. The supplied key allows you to turn the alarm on and off. There are also additional reed switches that may be purchased to allow more than one door to be monitored, in situations like double doors. Sometimes, a user may want notification of an exit, but does not need a loud alarm to sound. Some inexpensive, but highly effective products are the ST10, HS4317D, and HD4313 Exit Alarms. These products all retail from $21-$44, and are easy to install. All three of these products work with door/window contact sensors. When a monitored door or window is opened, an alarm sounds. The alarm sound is silenced using a supplied key or through a user programmed code. Businesses like using the ST10, HS4317D, and HS4313 to monitor sensitive areas like supply closets and utility closets in apartment complexes, gas stations, or office spaces. 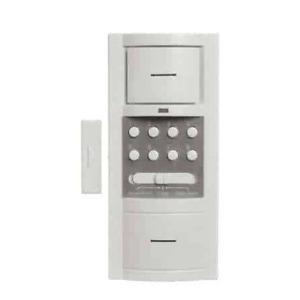 This will not only notify the manager of unauthorized access to a closet, but also serve as a deterrent to anyone unauthorized trying to access the area.For authorized access, the manager simply uses the supplied key, or punches in a code. When the door is opened, the alert does not sound. Most commercial locations must maintain exits for emergency situations such as fires. Visitors must be able to exit the facility quickly without needing a key. The challenge is that they want to keep the door locked, so people cannot enter from the outside. Products like the Alarm 250 and Alarm 700 by Alarm Lock allow you to do just that. In an emergency situation, users simply push the bar or paddle, which unlocks the door for a quick exit.